Q, Noise/Sound Design Sample from Vir2 Instruments. songboy's review"Nice collection of rare ethnic instruments and more"
I run this in Kontakt 5 on a Macbook Pro i7 and an RME Fireface 800. Q installed, performs and continues to perform without any compatibility issues. I have not read the manual as this set is pretty straight forward. All you do is install the Library, locate the sound you want in the Library Browser. Load that up and you can see all the effects and parameters you can change right on the GUI of the plugin. Very simple and very clean looking. It is kept this was because all the effects' specific parameters are only seen when hovering over the effect knob. This helps reduce clutter and I imagine give you greater control over each parameter as there is more room for more knobs/faders this way. I have not had any issues with glitches or audio pops. Also, I have not lost any work. I load up Kontakt and this plugin is exactly how I left it. So far, it has been very stable. No crashes or any other strange behavior. I give this plugin an 8 out of 10 for performance. Most of the sounds are quite nicely sampled, but some seem to come across kind of thin or sounding like someone already EQ'd them. This is not a bad thing necessarily, but I prefer to have the pure raw samples so I can decide on the EQ. I should admit that I am not familiar with a lot of the instruments that are offered so this could be natural aspects of the instrument itself. I also noticed that some instruments require a brick wall style limiter as some keys are relatively quite, and the next key could be 2-4 db higher. This can be a little frustrating if you are using this live and want good dynamics. But, the tools provided in the GUI can help solve this. I have been using this for a few months now. What I like most about this set is the large number of interesting (some of which I have never heard of) ethnic instruments. I imagine I could write most if not all of an older Kung Fu movie score with this set. I also really like the EFX offered. Some consist of chaotic bow techniques that can add some interesting suspense to your tracks (think Twilight Zone). What I don't like is the Volume issues I mentioned earlier and as well as, dealing with the chromatic sampled instruments, the inconsistency of note play. Key C2 may play a clean note of the instrument, where D2 may be a "glided" note. Again, this could be characteristics of the real instruments, I can't say for sure. All I can say is that you have to spend a little time with every instrument to prepare for its behavior. I will give it an 8 out of 10 for quality of sound. Some instruments sound a little thin and can be hard to sit in a mix, but most are very well done. I have used several sampled instruments of the ethnic variety (Soniccouture Gu Zheng, Arabic style Flutes, etc....) Vir2 Q contains many instruments I have not seen before. I would buy this again and recommend this to anyone who doesn't feel they have enough ethnic instruments laying around. As with any Kontakt library the installation is very straight forward. Pop in the disc, copy the files to wherever you want, and Kontakt will find them. If that doesn't happen you can manually show Kontakt where the files are which is very easy. 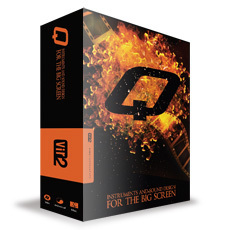 Once you have Q up and running you'll notice that it is a very easy VST to navigate. If you've never used Kontakt before it will take some time to get acquainted but if you have using Q for the first time should be a breeze. The program also comes with a manual and instructions on installation in case you get lost. Q runs on Kontakt, so it is compatible with PC and Mac. I've been using it for about a year now and I haven't had any problems with the VST. It isn't very CPU intensive either. I'm running a Dell XPS 7100 studio with six cores and 6GB of RAM but even on a computer that is less suited for music running Q should not be much of a problem. It has never been the cause of a crash, and everything about it seems stable. The loads time are very quick as well. The Q is an average VST instrument. It isn't going to coover any of your bread and butter sounds, so if your looking for an overall instrument I would recommend a different plugin. The Q is marketed toward "sounds for the big screen". While the sounds certainly fall short in that respect, they do manage to sound good in my beats. Q comes with a variety of sounds ranging from granular orchestras to unique choirs. Some of the sounds are cheap and generic. Others are very unique and creative. Your going to have to really find what you like out of this VST before you really enjoy it, but believe me there are some good gems in it. I probably wouldn't buy it now that I know what is in it, but if you somehow manage to get it for a discount, and you already have your basic sounds covered, I'd recommend it.